The Alula Sofa is a wonderful addition to any contemporary home. With it's beautiful design and fantastic features this sofa will add that extra pizazz you want in your living room. Available in over 300 different upholstery options, you can design the Alula Stationary Sofa to fit perfectly in your home. 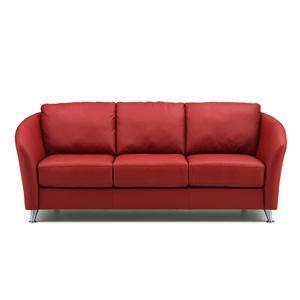 The Alula 77427 Stationary Sofa by Palliser is available in the area from furnishingretailers.com. The Alula group combines beautiful design with contemporary styling to create furniture you can be proud of. This series features a sectional sofa and a stationary sofa. Each piece has beautiful flaired arms, tapered exposed legs and the upholstery is available in over 300 different options. You can truly create the home design of your dreams and rest assured that the Alula group is made with care and will last for years to come. The Alula 77427 collection is a great option if you are looking for Contemporary furniture in the area. Leg or Skirt Tapered exposed wood feet on the sectional and tapered exposed metal feet on the stationary sofa. Browse other items in the Alula 77427 collection from furnishingretailers.com in the area.